Engineered to mesh seamlessly with 5.11® bags, belts, and packs, the Strobe/GPS Pouch keeps your sensitive electronics safe and secure. Sized for a standard strobe or GPS, this handy pouch can also accommodate a smart phone, digital camera, or similar handheld device. 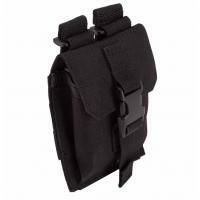 Compatibility with MOLLE and SlickStick® web platforms allows easy integration into your tactical kit.